Bluehost vs GoDaddy – Webhost Wars: Which Should You Choose? These days, looking for the best web hosting company for your website / blog can be a nightmare. With thousands of companies offering web hosting services, it could be likened to finding a needle in a haystack. As a result, many become overwhelmed and end up making the wrong choice. And we all know that is a mistake you cannot afford to make. Thus, it is important to do some research, narrow down your choices, and make in-depth comparisons between and among these web hosting companies. Two of the names that make most shortlists are Bluehost and GoDaddy, and these are the two webhosting providers that we will be comparing in this article. In the world of web hosting, both Bluehost and GoDaddy are considered to be veterans. Bluehost was founded in 1996 and GoDaddy a year later, in 1997. With more than 15 years in the industry, it comes as no surprise that these companies now host millions of domains. Bluehost, with its sister companies FastDomain and HostMonster, hosts over 2 million domains all over the world. GoDaddy, on the other hand, is the fastest growing web host today, with more than 55 million domains under management as of 2013. Clearly, these two hosting companies have a lot to offer. The question is: when it comes to shared hosting, which is the better choice? In order to answer that question, we have to take a deeper look at their differences and similarities, if any. First, let us take a look at the hosting products or packages offered by both companies. Bluehost has always specialized in shared web hosting from the beginning, although it also started offering VPS and Dedicated Server hosting in 2013. GoDaddy on the other hand has established itself as a one-stop-shop, with a wide variety of products to varied users. Aside from basic shared web hosting, GoDaddy also offers advanced hosting options, such as VPS, dedicated servers, managed hosting, and even reseller hosting. Bluehost offers two shared hosting packages: Basic and Pro. At $4.95 per month, Bluehost provides Basic users with UNLIMITED domains, storage, websites, and email accounts; a free domain; automated backups; and 24/7 technical and customer support. Upgrading to a pro account will increase the monthly rate to $19.99, with Pro features thrown in, such as domain privacy; more than 5 times better server performance; a dedicated IP address; SSL certificate; Backups PRO; and additional 10 anti-spam email accounts. What’s more, these packages come with a money-back guarantee. 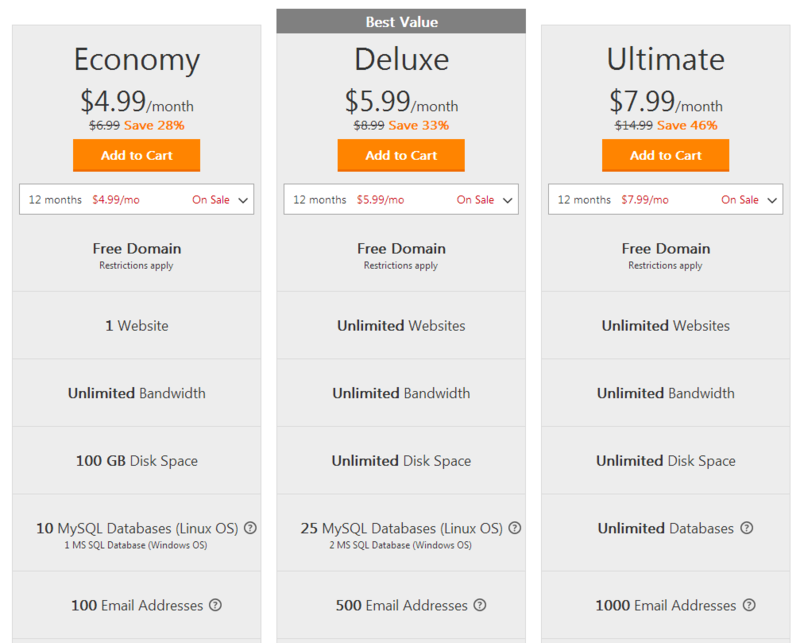 GoDaddy, on the other hand, offers three packages: Economy, Deluxe, and Ultimate. Their basic plan, Economy, consists of 1 website, 100 GB disc space, 10 MySQL databases for Linux OS or 1 MS SQL Database for Windows OS, and 100 email addresses. Originally, Economy is priced at a monthly rate of $6.99 but is now lowered to only $4.99 per month. Their Deluxe Package supposedly offers the best value among their shared web hosting services. From $8.99, users now need only pay $5.99 per month to host unlimited websites, with unlimited bandwidth and disk space, 25 MySQL Databases for Linux OS or 2 MS SQL Databases for Windows OS, and 500 email addresses. 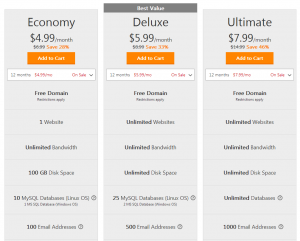 GoDaddy’s Ultimate Package is priced at $7.99 per month (it used to be $14.99) and has similar features as the Deluxe Package, except for unlimited databases and 1000 email addresses instead of 500. Users also get Premium DNS and SSL certificate, subject to certain restrictions. Verdict: The Basic packages of both Bluehost and GoDaddy are both priced almost the same monthly rate, at $4.95 and $4.99, respectively. Those who opt for a Basic plan will get more value from Bluehost’s offering, considering how it offers almost unlimited everything, including databases. GoDaddy’s Basic package, on the other hand, is severely limited in comparison. The price disparity becomes more glaringly significant if you update to a higher plan. Upgrading to a Pro package in Bluehost costs $19.99 monthly, while the GoDaddy’s Ultimate package is priced at a lower $7.99 per month. Users with multiple websites will also end up saving a lot of money with Bluehost because you can host them all using one package. But if you only have the one website, GoDaddy’s Economy package’s 1 website limitation won’t be an issue. Now, if you are on a tight budget, looking for a dirt-cheap basic web hosting service, Bluehost is the obvious choice. However, if you plan on getting a higher-than-basic account and you can live with certain limitations, there’s no doubt that GoDaddy will cost you a lot less. The money-back guarantee in Bluehost’s package also goes a long way in putting customers’ minds at ease. The features of both web hosting companies’ shared web hosting services were mentioned earlier in their package offerings; now it’s time to dig a little deeper. Bluehost offers more flexibility when it comes to its databases, using PHPMyAdmin and MySQL, while GoDaddy is limited to MySQL only. Bluehost also wins, on all counts, with respect to disk space, easily trumping GoDaddy’s disk space limitations. Again, if you only have a single website that you plan to host, GoDaddy works just fine. But the unlimited websites, domains and email accounts offered by Bluehost makes it ideal for those who are planning to host multiple websites, since they no longer have to get separate hosting plans for each domain. Unless you choose GoDaddy’s Economy plan, the disk space provision of both web hosts is also the same: unlimited. The unlimited file transfer capability available in Bluehost also makes it the more attractive option. While it is true that GoDaddy also offers backups, there is no denying that Bluehost gives the better deal, with its automated data backups, which is further enhanced when you go Pro. Both Bluehost and GoDaddy also offer e-commerce applications, which is perfect for users who need an online store management system in their websites. In this regard, Bluehost once again comes out on top, boasting e-commerce applications and platforms such as Zen Cart, SSL, Shared SSL, CubeCart, Agora and Magento. GoDaddy, on the other hand, only has Zen Cart and SSL. Another area where Bluehost offers more is the accumulation of web statistics. It has referrer logs, a raw Log Manager, error logs, AWStats, and Webilizer. GoDaddy has none of these. Verdict: Setting the price factor aside, comparing the two companies’ Basic packages based on features alone shows Bluehost as the clear winner. In fact, even if you compare the features of Bluehost’s Pro package to that of GoDaddy’s Ultimate package, Bluehost still wins by a mile. There is now the question on which web hosting is more user-friendly. Of course, your level of technical know-how will be factored in. This aspect may not matter much to experts who are fairly adept at programming, but beginners will naturally prefer an interface or setup that is very easy to understand, navigate, and use. Take a look at the “backend” – the screen, dashboard or control panel – users are presented with once they have purchased a hosting account and logged into the web hosting site. Bluehost’s control panel is called, well, cPanel. At first glance, the smattering of icons and options on the screen is daunting, but once you get the hang of it, navigating through it is very easy and straightforward. GoDaddy has come up with its own custom backend which looks initially to be uncomplicated. However, it is only when you attempt to do more that things with GoDaddy’s interface becomes tricky, not to mention frustrating. There is also the matter of Bluehost’s automated script installer – the Softaculous – being more intuitive and faster, allowing the installation of more than 300 popular software for the website to be hosted. GoDaddy’s script installer offers only a handful of applications. There is also a waiting period involved when managing websites via GoDaddy’s in-house backend. This is because it queues all requests related to website or account management. Users end up having to wait for at certain length of time until their requests will be processed. Verdict: GoDaddy’s control panel is user-friendly IF you prefer something that is easy to use, and you don’t really plan on making changes or hosting account management actions that go beyond the basics. 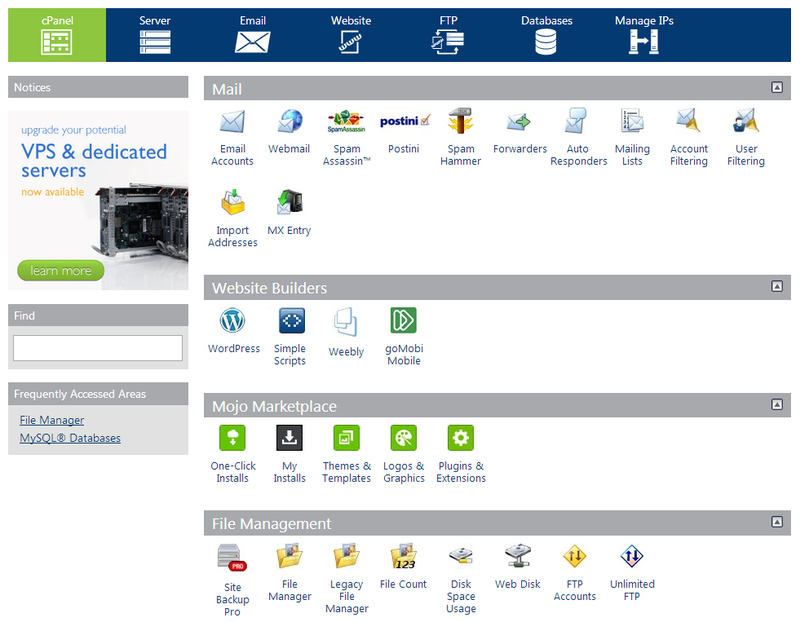 However, in the long run, Bluehost’s user interface offers more flexibility and options, as well as speed. Don’t be intimidated by the “many icons and options” seen on the screen; they’re there for a reason, and that is to give you more control or power over managing your accounts. It is inevitable that you should run into problems or certain issues with your web hosting, and it certainly helps if your chosen hosting service can be reached at any time of the day (because, really, problems arise when we least expect – or want – them to). Fortunately, both Bluehost and GoDaddy offer exceptional 24/7customer support, starting from a very informative FAQ and Help sections to interactive tools, such as email and phone. GoDaddy’s phone support has a 36-minute expected wait time, and utilizing only one phone line – no toll-free phone number. Bluehost, on the other hand, involves an average wait time of 9 minutes through two phone lines: a toll-free line for users in the United States and another line for customers outside the US. The email support of both web hosts is done via support tickets. Bluehost guarantees a response period of 24 hours when contacted via email, while GoDaddy do not give out any assurances as to how quick they can respond, only that priority is given to users who are logged into their site. Meanwhile, Buehost also has a live chat team available to assist customers in real time, 24 hours a day, 7 days a week. Another noteworthy addition to the customer support of these two webhosts is the integration of user forums in their customer support. GoDaddy also set up its own blog for news and updates about its products and services, and hosts the GoDaddy IdeaShare, for a more interactive user experience. Bluehost also deserves commendation for uploading video tutorials on their site, while maintaining a deep and vast knowledgebase. Bluehost users can also keep track of their support history when they log into their accounts on the site. Speaking of interactive, Bluehost and GoDaddy also tapped into the social media trend, making their presence felt on Facebook and Twitter. Verdict: GoDaddy’s customer support gets the job done. From firsthand experience by many users, GoDaddy’s support is “adequate” and “meets their expectations”. But the clear winner for this round is still Bluehost, with its fast response time and customer service that “exceeds expectations”. Now this does not come as a surprise at all, since Bluehost is one of the highest rated in terms of customer support. It’s time to take a look at the performance – in terms of speed – of both web hosts. Website speed tests conducted on Bluehost and GoDaddy showed that they both set low memory limits initially. Bluehost has the upper hand in this, since it allows the option of upgrading to Bluehost Pro, which speeds up performance by up to 5 times. In GoDaddy, the hosting account will require more optimization in order to get better performance. As things are right now, there are quite a huge number of customer complaints about GoDaddy web servers being unable to handle high loads of traffic. Verdict: Basically, Bluehost and GoDaddy do not have significant differences when it comes to load time. It is, however, general knowledge that GoDaddy’s web servers are much slower when it comes to processing time. If you are thinking long-term, Bluehost is the better choice. As mentioned earlier, Bluehost also started offering VPS hosting and dedicated server hosting in 2013, two products that were already included in GoDaddy’s product line. Both web hosts also offer a number of packages or plans for these products. For purposes of comparison, we will focus on their “best value” plans. Bluehost’s Enhanced VPS hosting charges $29.99 for the first month, renewable at $59.99 for every succeeding month. This is certainly more expensive than GoDaddy’s Value VPS plan, which has a monthly fee of $39.99 (discounts are available for 12-month and 24-month prepayments). Both plans support a monthly bandwidth of 2,000GB (or 2TB) and 60 GB storage. However, Bluehost’s plan offers 4GB available RAM, which is twice more than GoDaddy’s 2GB RAM. Bluehost also threw in two CPU cores, 2 IPs, and a free domain. When it comes to dedicated servers, GoDaddy’s Value Deal’s features include Intel Core i5 quad core CPU and a 4GB RAM. Customers will also get a storage of 2 x 300 GB hard drives, and a monthly bandwidth of 10TB. All these are at a monthly fee of $149.99, with discounts available if customers choose a 12-month or 24-month term. Bluehost, on the other hand, offers its Enhanced plan at $99.99 for the first month, then renews at $199.99 per month. It also features a 4 x 2.5 GHz quad core CPU, a 10TB bandwidth, and 1TB storage. However, it has 8GB available RAM against GoDaddy’s 4GB. Aside from a free domain, those who avail of this plan will also get 4 IPs. Verdict: You know what they say about getting what you pay for. On a monthly basis – after the first month – Bluehost’s VPS hosting and dedicated servers hosting is more expensive. But it makes up for the price by adding more features and functionality in their packages. 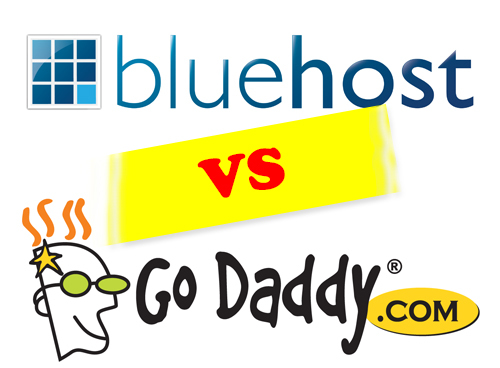 The Verdict: Bluehost or GoDaddy? When it comes to package offerings, hosting features, usability, performance, customer support, and other product offerings, Bluehost is way ahead of the race against GoDaddy. It is in the pricing that things get quite tricky because, well, looking at the figures alone, it is clear that Bluehost is the more expensive web host. Cost-benefit analysis, however, would show that you will still get the most bang for your buck even if you pay for the higher price tag attached to Bluehost’s hosting services instead of GoDaddy. Now, which one should you choose? The answer will depend on what you actually need in a web hosting company. Your know-how, and even your willingness to learn about how these web hosts work, will also have to be factored in. If you are looking to invest in a web host that will serve you well in the long run, and you do not want to be hampered by the limitations set by GoDaddy, then go for Bluehost. In fact, if you want to get the best overall deal on web hosting, Bluehost is the one that is highly recommended. If, on the other hand, you are operating under strict budget constraints, and you do not foresee GoDaddy’s limitations to be a problem with your hosting, then there’s no reason why you shouldn’t go for GoDaddy. Whatever choice you make, you have to be sure that you have given it proper thought, and weighed the pros and cons while taking into consideration your own needs and particular circumstances.